The true meaning of Holistic therapy is found in the root of the Greek word, 'holos' meaning ‘whole’, balancing the whole physical, mental and emotional/spiritual being. The concept of considering the ‘person as a whole’ is not new, but can be traced to different ancient cultures all over the world. Both eastern and western ancient philosophers have regarded the human being as the summation of different physical, psychological, emotional, social and spiritual factors and studied how these elements influence each other. The science of Holistic therapy considers the human being as a whole; where the body, mind and spirit are equally involved in creating and maintaining health, balance and a sense of wellbeing. The whole person is therefore not only physical, psychological or spiritual. 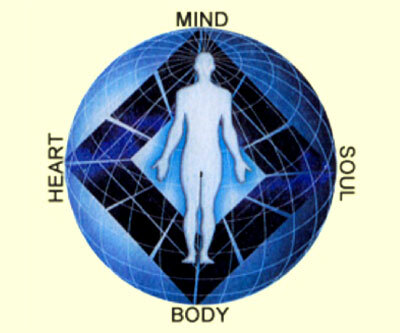 All these three components/parts are intrinsically connected and influence each other. When one part is adversely affected by the symptoms of illness or stress, the whole balance is broken. Taking a holistic approach to a therapeutic treatment means ‘treating the person as a whole and extends to developing a positive approach to a holistic lifestyle and mind-set’. As such, a Holistic Therapist takes into account all aspects of an individuals lifestyle choices and their responses to stress caused by modern day living, not just the physical symptoms. A Holistic massage can vary from using classical massage movements with light pressure to a variety of massage movements ranging from; pressure point massage to relieve tense/tired muscles, deep tissue manipulation, stretches, mobilisation of limbs and joints, vibrations, static energy holds, gentle rhythmic rocking and manual lymphatic drainage to release toxins from the body. In this way all the systems are encouraged to work together more efficiently ‘in harmony to promote health and a sense of well being’. A Holistic massage treatment aims to; reduce the negative effects of stress, relieve the discomfort of aches and pains, stretch and mobilise tight muscles, realign postural muscles, relax the mind and ‘in essence, restore the body’s vital force or its own self-healing capacity to protect, regulate, renew and heal itself on every level; physically, mentally and emotionally’. The individual’s emotional state and willingness to (1) provide verbal feedback, about ‘the sensations they feel’ during the treatment and (2) commit to following the recommended after-treatment and home-care advice, are also essential requirements for effective treatment progress and results. A Holistic massage, apart from being a very relaxing treatment, has been a popular form of therapy to help alleviate the symptoms of the following stress related conditions; skin disorders, tension headaches, migraines, anxiety, depression, panic attacks, stress, sleeping problems (insomnia), sinus problems, breathing problems, digestive problems, arthritis/joint based problems, back pain, postural problems, hormonal imbalances, premenstrual syndrome (PMS), fertility, menopause, high blood pressure and poor circulation. As with most other holistic and complementary therapies, Holistic massage is totally safe for people of all ages; especially the elderly and people in convalescence. It is renowned for bringing relief from a wide range of acute and chronic conditions, and works in tandem with, and is not a substitute for conventional medicine. It is important to remember that a Holistic Therapist does not treat or diagnose any condition; it is the ‘continued release from the symptoms of stress which helps manage pain’. You should always refer to your GP or other qualified health professional first; to diagnose any health concern that you may have and for guidance about the appropriate medical treatment. If you are being treated by a GP for anything please let the Therapist know in advance.